Kathleen Detlet, D.Min. is a certified spiritual director and graduate of the An Croi’ Spiritual Guidance Program. Kathy has taught on all levels of education and now enjoys offering retreats, days of prayer, and journeying with others as a spiritual guide. She holds a Masters in Liberal Studies from Wesleyan University, a Masters in Counseling from Seton Hall University and a Doctorate in Ministry from Drew University. Dr. Detlet is Co-Director of the Lumen Center and on Sacred Thread Ministries Retreat Team at St. Mary Abbey, Morristown, New Jersey. .
Eileen Carmody, PVBM, is a Sister of the Presentation of the Blessed Virgin Mary. Her interest and background in Spirituality and Spiritual Direction complement her years as a teacher and dialysis nurse. She holds a Masters Degree in Spirituality with a concentration in Spiritual Direction from Fordham University. Presently, Sister Eileen is the Health Care Coordinator for her congregation and continues to minister as a spiritual director and retreat director on a part time basis. Anita M. Constance, SC, is a certified spiritual director and graduate of the An Croi Spiritual Guidance Program, receiving a diploma in Spiritual Guidance from the Jesuit Milltown Institute in Ireland. She is the author of several spiritual books, and experienced in giving retreats and workshops. Sister Anita received an M.S. from Fordham University where she focused in spirituality and pastoral counseling. Healing Touch, bereavement counseling, and spiritual direction are among her ministries. Sr. Anita is a member of the Sacred Thread Ministries Retreat Team in Morris County. Father James Manos was born in Jersey City and educated by the Caldwell Dominicans and the Jesuits. He graduated from New Jersey City University, and Seton Hall University. 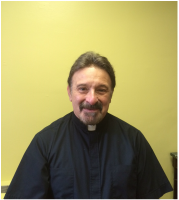 Prior to priesthood Father Manos was a special needs teacher and a member of the child study team.He is a convert from the Greek Orthodox tradition. Ordained to the priesthood in 1996, his assignments were as parochial vicar at Our Lady of Fatima, Newark, Holy Spirit, Union, Saint Paul, Ramsey, and as pastor of St. Vincent de Paul, Bayonne, St. Thomas More, Fairfield and currently Saint Luke, Ho-Ho-Kus. Father James is one of the trustees of Saint Dominic Academy, Jersey City. He is also a certified spiritual director. Patricia Crowley, OP, is a Caldwell Dominican, presently directing the Lumen Center at Caldwell, New Jersey. It is under Sister Pat's guidance and outreach ministry that The Lumen Center has evolved into a major center for spirituality programs. Sister Pat has worked in education as an administrator as well as an elementary and secondary teacher. She worked for twelve years as a staff member for RENEW International. Sister Pat holds a Masters in Christian Spirituality from Creighton University, Omaha, Nebraska. Kathleen Detlet, D. Min. enjoys offering days of prayer and retreats; a certified spiritual guide, she recently received a Higher Diploma in Spiritual Guidance from the Jesuit Milltown Institute, Dublin, Ireland. Kathy has earned a Masters in Liberal Studies from Wesleyan University, a Masters in Counseling from Seton Hall University, and a Doctorate in Ministry from Drew University. Dr. Detlet is Co-Director of the Lumen Center and is a member of the Sacred Thread Ministries Retreat Team in Morris County. Ginger Grancagnolo, Ed.D., OPA is a Lay Caldwell Dominican Associate. She is a lecturer, author and private counselor. Thirty years experience in the fields of education, psychology, and theology has earned her many degrees and a sound practical approach in helping others toward self-assertion. She has created many healing CD workshops and is the author of Who Would I Be If I Weren’t So Afraid? The Mother Principle, and The Father Principle. Dr. Ginger is an adjunct professor at Bloomfield College in the Department of Education. She recently completed a Doctorate in Christian Ministry. Catherine Reilly, OP, Ed.S., is a Caldwell Dominican who has worked in education as a teacher and administrator. She is a Marriage and Family Therapist. She has initiated the Prayer Shawl Ministry at the Lumen Center, and a Bereavement Support Group which she facilitates at the Center. Paul D. Sansone has studied Scripture and Liturgy at the Catholic University of America, Washington, D.C. He is very active and committed to Adult Education, especially in the areas of faith formation. Paul is a popular presenter at the Lumen Center.